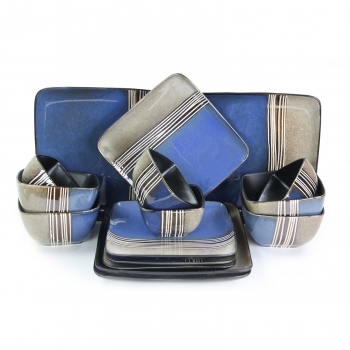 Elama presents the Uptown Loft 16 piece Modern Premium Stoneware set with a Double Bowl table setting for 4. This dinnerware set is ready to make a statement at your next dinner party. With a sophisticated and bold color block design this set is pure style and individuality. Uptown Loft's tones are chosen to highlight your meal and accentuate the naturally scrumptious hues of the foods this plate so elegantly displays. This high quality stoneware set feature large dinner plates measuring diagonally at 13.25". No matter the appetite of your guests this plate will be up to the challenge. The Desert Plate is not far behind with a an impressive diagonal measurement of 11.5" for any guest with an extra large sweet tooth! And in addition, there is a perfectly portioned Desert Bowl measuring at 5.5" Diagonally. This unique combination is the perfect place setting to accommodate meals with more courses, or extra condiments and tasting options for the table to share. * Four Large Dinner Plates 10.25 x 10.25", Diagonally 13.25"
* Four Large Salad Plates 8.25 x 8.5", Diagonally 11.5"
* Four Large Bowls 6 x 5.75 x 3.25", Diagonally 7.25"
* Four Desert Bowls 4.5 x 4.25 x 2.25", Diagonally 5.5"
Dinnerware is Crafted of High Quality Stoneware. Dishwasher and Microwave Safe for your convenience.